The Evelyn Stover Recycle Center has been a highly successful facility that has served the residents of Washington County for decades. In the past four years under the management of the Weiser River Resource Council (WRRC), the Center has generated $30,000 in income and reduced solid waste transfer costs by $17,500. Yet in spite of its proven success, the Washington County Commissioners are willing to allow it to be shut down. This shortsighted decision ignores the fact that the Payette landfill will need replacing in the future and the Center can help extend the life of the current landfill by many years. It ignores the thousands of people who faithfully collect their recycle materials every week and bring them to the center. It ignores the benefit of its income to the County and its reduction of solid waste transfer fees to both County and City. We urge all interested parties to contact the Commissioners and Council members and demand the Center be continued without pause. In a recent article in the Argus, Commissioner Chandler stated that a County wide operation would cost $500,000.00. Commissioner Chandler also stated that only 200 County residents support recycling. The figures provided by Commissioner Chandler cannot be substantiated by past and current operating costs. Discussions with the Commissioners over the past two years have never included costs anywhere near this high. Commissioner Chandler’s comments imply that these costs would be incurred because Washington County would be taking over the Center from the WRRC. However, The Center is and always has been a joint project of Weiser City and Washington County. The property and forklift are owned by the City and the building provided by Washington County. 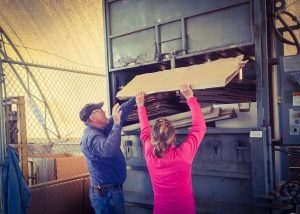 The County would not be starting a new recycle program, but would be continuing a project they joined some 20 years ago. Over the last 4 years, from September 2014 to August 2018, the Center has collected 1,163,952 pounds of recyclable materials. It takes more than 200 residents who support recycling to achieve this goal. But those 582 tons are only half of the materials that could have been collected. Due to the resource limits of a volunteer workforce, materials could not be collected from local businesses who lacked the ability to transport the materials to the Center. Starting September 26, the only action needed by the County is to replace the volunteers with County employees. During negotiations the Commissioners said they would use part-time County workers getting minimum wage and no benefits. The WRRC volunteer force logged approximately 1300 hours per year, which when replaced with hourly employees will increase the operating cost of the Center by $14,300.00 per year. We have an efficient and well run Recycle Center now. The County Commissioners need to recognize its benefit to the County and build on that success. Please contact your County Commissioners and City Council members and let them know you want the Center to be continued for the benefit of all Washington County residents.